Shoppers look forward to merchant side-walk sales offering “must have” bargains in Geneva’s 100+ specialty shops. Sweden Väst will be open on Sat. & Sun. on S. 4th and State St. Purchase Swedish inspired art, taste Swedish delicacies and pastries and of course meatballs. Assist in the decorating, raising, singing and dancing around the Maypole. Swedish entertainment both days. Get your Swede on at Sweden Väst this year. Free nightly musical entertainment on Central Stage kicks off Tuesday with 7th Heaven, 3–5pm. Dennis O’Brien Band, Heartache Tonight, Hillbilly Rockstarz and The Moods will also be performing, 1–3pm. Wednesday, Thursday and Saturday afternoons relax on the courthouse lawn and listen to featured artists. Talent will be phenomenal at “Geneva’s Got Talent. Semi-finalists perform Wed., June 24; the finals are Sat. night, June 27 and win $1000 first prize. Feast on traditional Swedish and favorite American and ethnic foods including, brats, ribs, turkey legs, veggie burgers, wood smoked pork sandwiches, meatballs, pizza, garlic crab pasta and burritos to name a few. Sinfully good desserts will also be available. 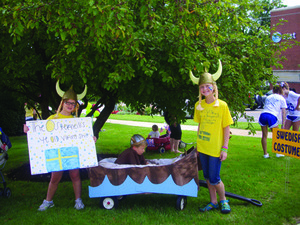 Kids will want to be at Swedish Days 2015 every day, but Tuesday’s kick-off explodes with activity. Creation Station opens at 10am followed by Circus on Third debuting at 1pm. Istavan& His Imaginary Band rocks Third St. and The Midwest Fun Factory will paint your face. All this happens in front of Central Stage. And the favorites continue—the carnival; 3-on-3 Basketball Tournament, Quad Power Jump, Fun at the Library Tent and mini golf. June 26 is “Kids’ Day.” All Star Sports coaches will try to dodge getting dunked. The Geneva Park District will coordinate games and activities on the courthouse lawn and Sunset Dancers, Geneva Gymnastics and Geneva Angels Cheerleading will perform. The Fire Hose Challenge also returns for 2015. 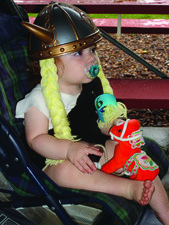 The Kids’ Day Parade invites children through the age of 10 to enter in one of these parade categories: Fun with Duct Tape, Swedish Costumes, Decorated Bikes &Trikes, Anything Goes and From the Movies. Decorate a bike, decorate yourself or do both. Participants should stop by the Chamber office at 8 S. Third St. to pre-register, or call 630-232-6060. On Sunday, bring some chairs and blankets so the entire family can enjoy the 66th Grand Parade—truly a community parade that over 45,000 will be viewing. Free admission. 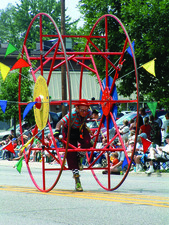 Events, hours, and schedule will be available late May at genevachamber.com or call the Geneva Chamber of Commerce at 630-232-6060.